Give your bird a entertainment and have hours of fun watching them play. An ideal toy designed for your little pet to stand, easy install in the cage. 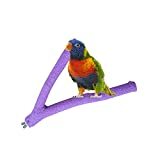 Give your bird a treat and have hours of fun watching them play. This entry was posted in Birds and tagged African, Bird, Budgies, Cage, Cockatiels, Conure, Finch, Greys, Lovebird, Macaw, Parakeet, Parrot, Perch, Shelf, Stands, Wood by One Boutique. Bookmark the permalink.